We investigate Einstein’s theory of general relativity and its possible extensions in both the classical and the quantum regime. The methods involved include quantisation of general relativity, an analysis of its gauge structure, and quantum theory in curved backgrounds. Particular applications are cosmology and the physics of black holes. Among the known interactions in Nature, gravitation is unique in that it acts universally on all kinds of matter and energy. It dominates on large scales (cosmology) and for compact objects (neutron stars, black holes), but is also important for everyday physics. The gravitational interaction plays a central role in the interplay between astrophysics, cosmology, and particle physics. Modern gravitational theory started with Newton’s universal attraction law (1687): The gravitational force between two bodies is proportional to mass 1 times mass 2 divided by their distance squared. As soon as high velocities are involved between the masses, Newton’s theory is superseded by Einstein’s gravitational theory (1915), also called general relativity. Therein, gravitation is a manifestation of the geometry of four-dimensional spacetime. 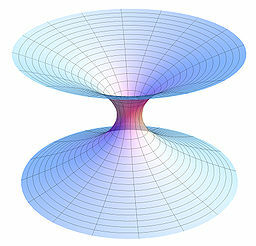 For macroscopic phenomena, general relativity is an experimentally well established theory.